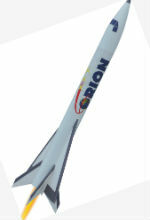 This attractive rocket model has an unusual fin arrangement but nevertheless is relatively simple to build. Stickers for cockpit windows and wing edges, it is immediately recognizable as a star traveler. All wooden parts are made of CNC milled plywood; the two main support surfaces are connected to the fuselage by pre-punched slots.